I knew a lot of people who buy bedroom sets when furnishing their rooms. There's nothing wrong with that, but if you want a more personal feel to your space, better mix them up. This photo is obviously for showroom purposes, all brown, all wood furniture. It looks rather flat. I know its much easier to go for a set-- less thinking, less worries. But mixing things up is not that difficult as you might think, and the result will be much better. 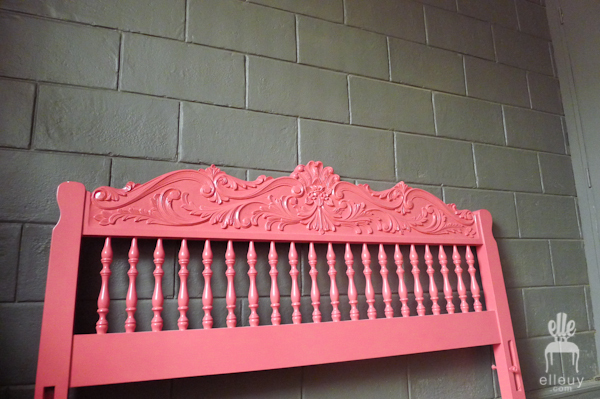 The red upholstered bed in here doesn't match with any of the furniture, but it works. The main thing is having a cohesive color scheme throughout the entire space. 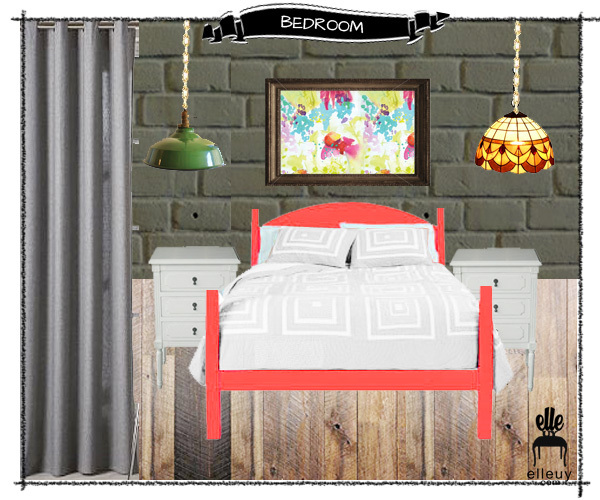 The bed matches with the curtains, the walls with the side table, curtain rod/frame with the chandelier. 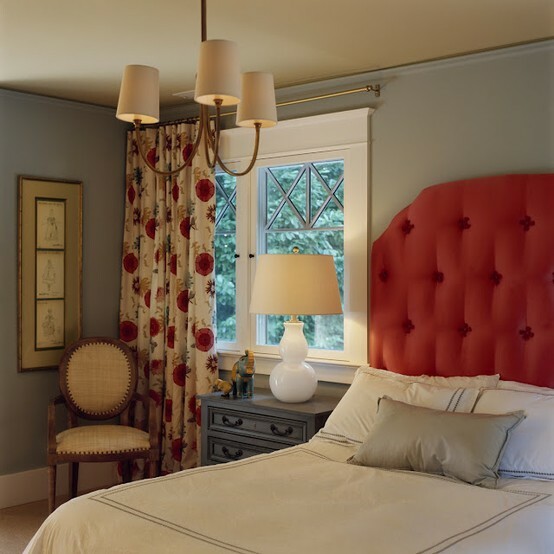 Upholstered bed can go with any side table. The rustic wood in the bench looks awesome in this fresh looking bedroom. Imagine having all that wood in the bed and side table and this room wouldn't look this great. White and wood is a great combo. 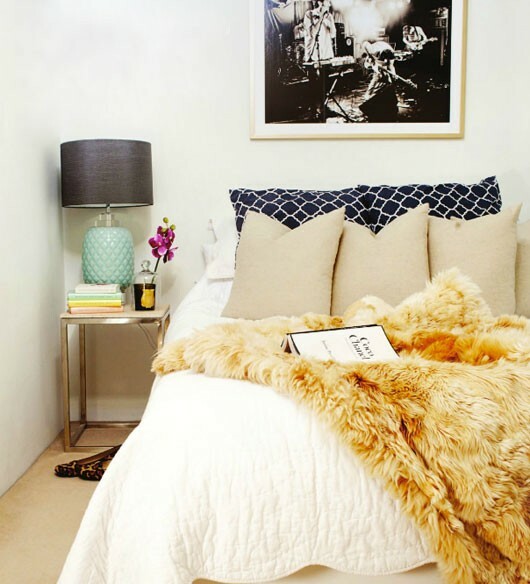 The white bed lightens up the space, while the wood side table grounds this room down. Perfect compliment. A very simple yet cozy bedroom set up. Headboard-less bed witha brass side table. You can even go as far as not matching the side tables. But if you're really particular and wants things to match, this is the way to do it. Okay, this might be too big for a home office. But lets just say we are all millionaires, had a big spare room with high ceilings and great architectural details, that we can use as an office. This is one way to do it, especially if you love feminine details that are not too femme. Huwaat? haha.. 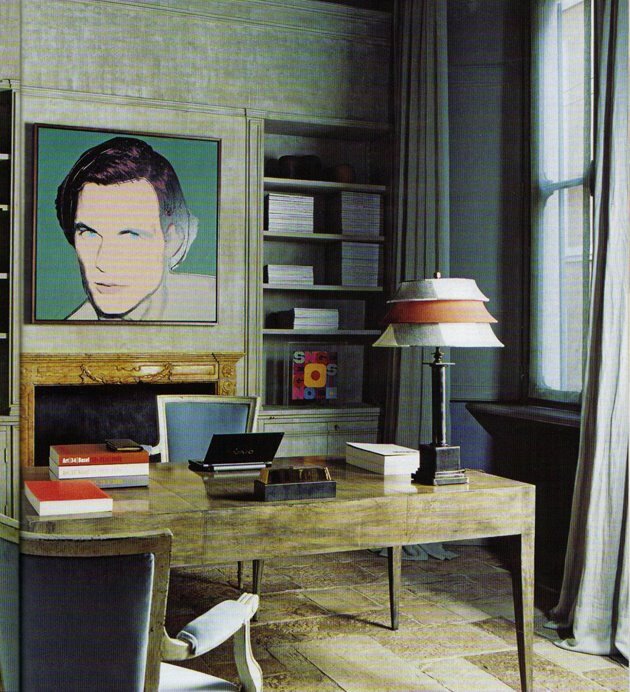 Lets say you love classic pieces (like the chair, the mantel, long curtains, and the moldings), but you want a toned down subdued version of it (neutral walls, neutral curtains, simple wood table, gray chair upholstery), and you want to hip it up a notch (very graphic artwork, pop of orange lamp, some colorful accessories), then this is your perfect peg. It's classic, glamourous, but hip and edgy at the same time. 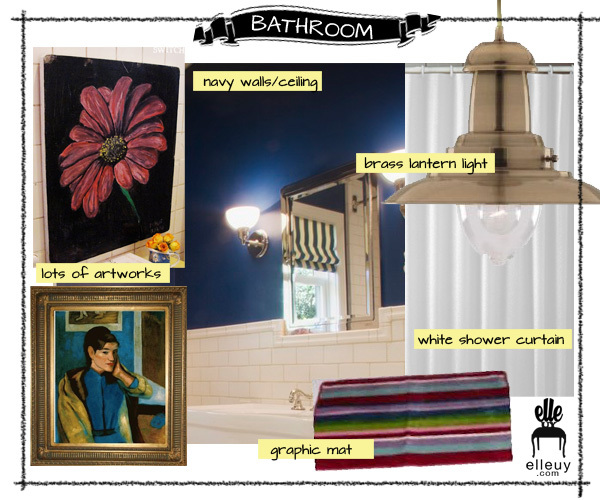 DuoDeco is the brainchild of yours truly and the BF. It all started out as a vague idea that we talked about casually for some time. He asked me what else I wanted to do, my answer was "I'd like to sell chairs." Yes, just chairs. HAHA... It's not a big piece, everyone needs it either as an accent, a work chair, a vanity chair, or whatever. I love making over vintage chairs, and so that was my answer. He told me why not sell other items, I just brushed it off and the discussion ended. He, on the other hand loves to create unique decorative MANLY items. I'm stressing the manly part just in case he's reading this. :) If you've been following my instagram, I've recently posted his previous works (here and here). A lot of other names were discussed, but its either he likes it and I dont, or vice versa. We've been thinking of different words that we can play around with, and when he said.. "Duo..? ", I said "DuoDeco?".. He likes it. I like it. Simple as that. It fits perfectly since we're partners in this, hence the "duo". And I don't think I need to explain the "deco" part. 2) Space. 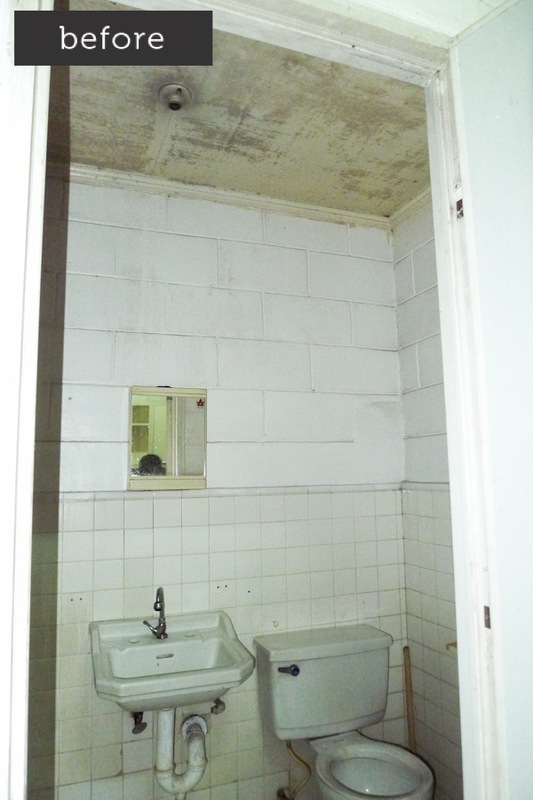 At least 100 sqm. We'll be packing the space -showroom slash office slash workshop slash lounge- so it needed to be a decent size. 3) Commercial yet not so much. Huh? Let me explain. It should be in a commercial area, but not a commercial space. Huh? Let me explain further. Since we wanted it to be easily located, it must be in a busy area, but since we're planning to have a workshop and a place where we can stay overnight if the need arises, it can't be in your usual commercial stalls/buildings. Clearer? I hope so. 4) Decent Facade / Neighborhood. This is a given. 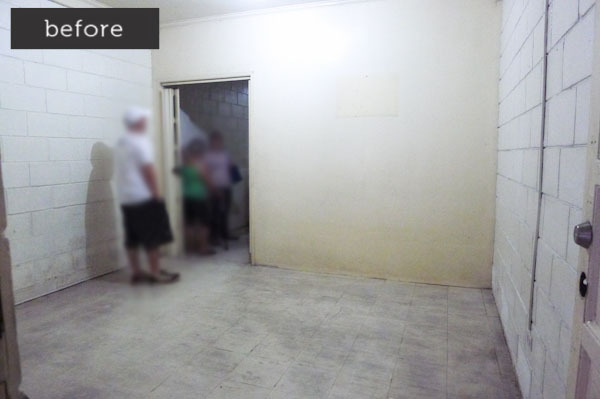 This is what you first see when you go to our place, that is your first impression. We don't want anything that would scare you away. A cool brick loft facade would be great, but impossible in this country of ours, so anything decent is fine. 5) Parking. We don't need a garage, we have our houses. 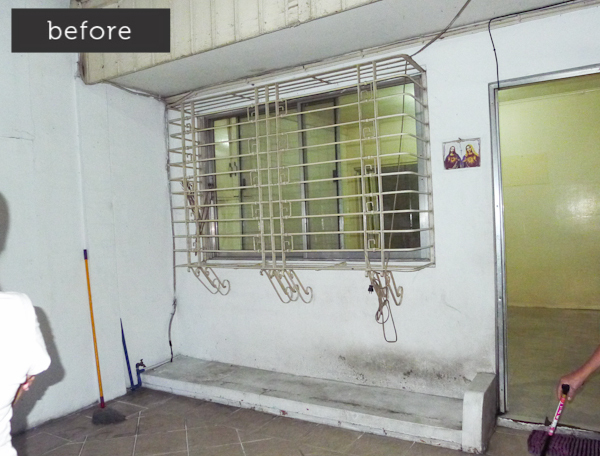 We just needed outside parking which potential clients can use. 6) Affordable. You may say.. "With all your criteria above, you're expecting to find something affordable?? Seriously?" Yes. We wanted a place that we can sustain for the long haul. We are almost losing hope but then a flick of luck turned when the BF was told that there's a "for rent" sign a few blocks from his house. 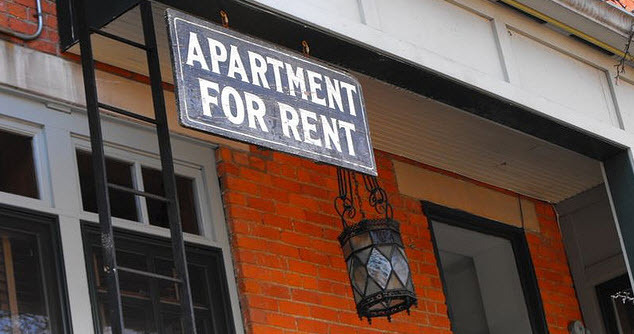 They knew the owner so they called them and asked which unit is for rent. Since we have this anxiety building up with all the search going on, we walked right out his door to see the unit. We fell in love. Very decent facade. Very near commercial streets (Quezon Ave and E. Rodriguez). Very near our place -5 minutes walk from his, 5 minutes drive from mine. We're sold right there and then. It's a small house that would probably fit a small family, or two grown adults who would need to fight over who gets the big bedroom. But our plan for the space is a different story. 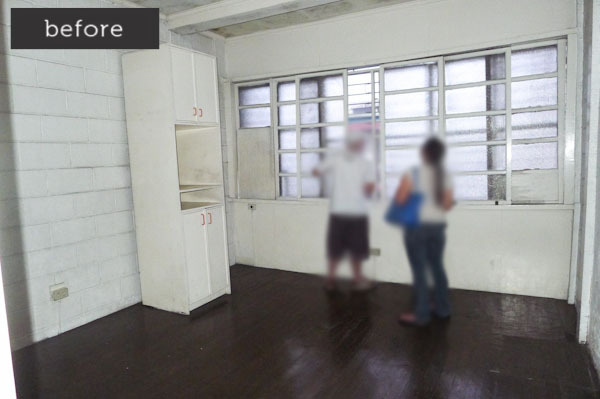 This will be the Future House of DuoDeco. After 3 very long weeks of waiting around to finally see the unit, the time finally came to view the inside for the first time. I know it's an old house so I wasn't expecting anything superb. Whenever I see a new space, all I see is the potential. And my imagination gear was totally on the moment we set foot inside. This is what you'll see once you enter the gate. It's an enclosed/outdoor space where we'll be hanging a huge navy chandelier. The window grills will be painted gold, and we're setting some art installation behind it. We'll also be showcasing some items here since it is somewhat enclosed. Once you enter the door, you'll see this living space. That wall will be knocked down to open up the entire first floor. I was happy to see that the walls look somewhat similar to bricks but in hollow blocks size. I love painted bricks, and anything I can get that looks like it, I'll take gladly. Here I was standing on the door towards the supposedly dining area. We'll be having the entire downstairs as a showroom so we doesn't need all the extra cabinetries, so we'll take them out. Stair rails will be painted blue, and the step will be sanded to show its natural wood. When designing for my own space, I don't make my usual moodboards since everything is just in my head. But for the sake of showing you guys what's really going in this brain of mine, I made a mock-up of the elements we wanted for the space. 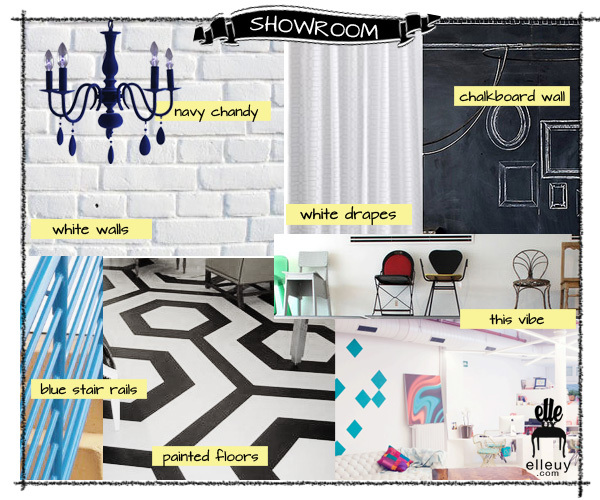 So here's the look we're going for for the showroom. We wanted white walls since we'll be having a lot of colors and textures in our items, they should be the star of the space. Accent chalkboard paint will go on one small wall. The idea really is just have a nice creative space to display our pieces. Oh and that painted floor is just an idea, I'm not sure if I can pull it off, but I will definitely try! 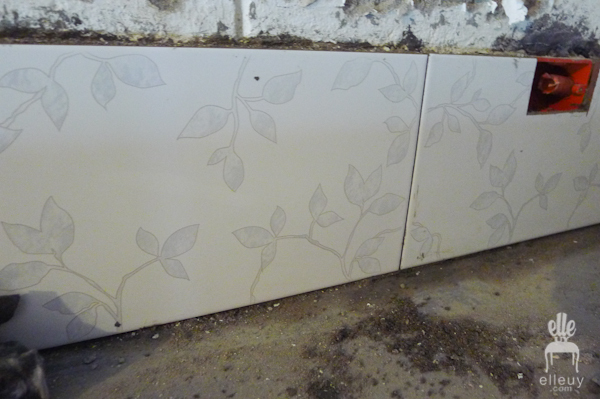 The kitchen will stay since we needed to eat, so we'll be incorporating it to the design. 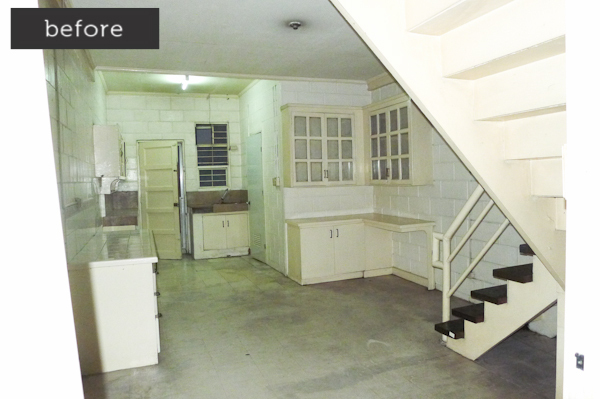 That glass paneled upper cabinets will be transfered to the kitchen side since it's so much nicer than the existing. 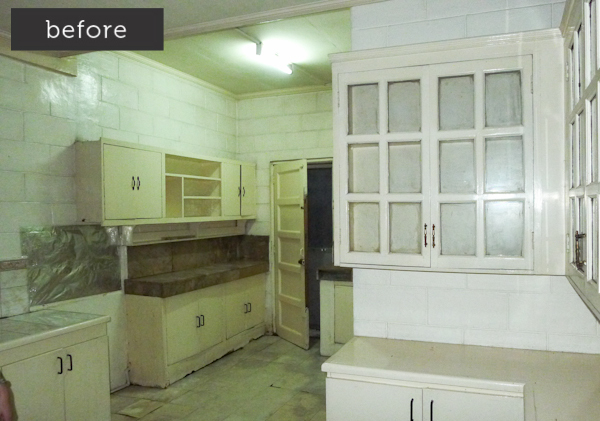 The plan is to have a fun kitchen that would compliment the showroom. 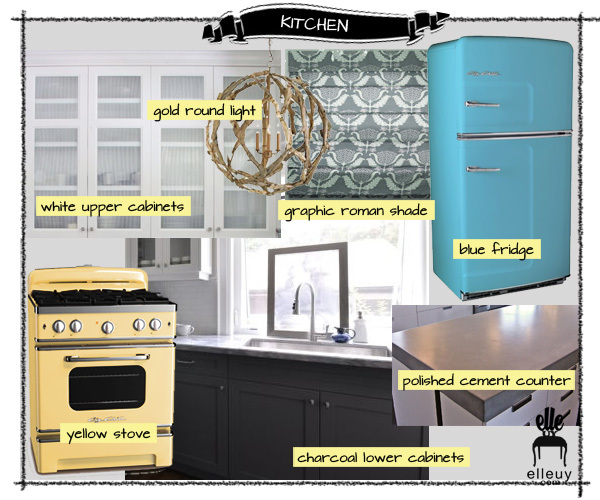 We're painting the fridge and stove to have that custom vintage vibe. I've always wanted a polished cement countertop and this is my chance to have them. Dark charcoal lower cabinets and white upper ones. A fun graphic roman shade for the windows. The bathroom is very reminiscent of our house's bath. Same tiles, same fixtures, same toilet and sink. I'm thinking this house was built within the same era as ours, meaning it is OLD. But it doesn't bother me one bit, I actually love the vintage looking sink. 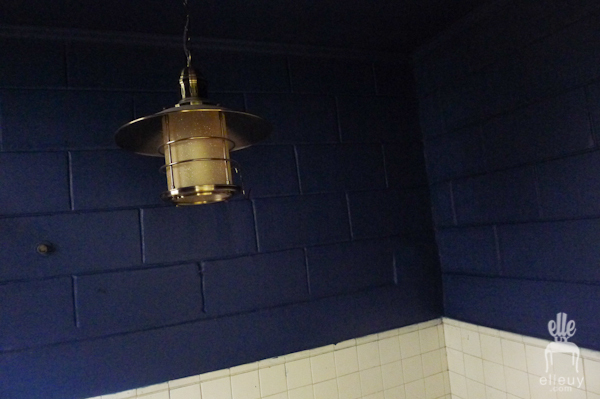 Since the tiles had faded, I wanted to set it off with navy paint for the upper walls and ceilings. It will set the mood for this space. Brass lantern light will hang in the center, thank you high ceiling. We'll be putting artworks and graphic mat to bring in some color. The bigger room will be our office / studio. This is where we'll spend most of our time so the design MUST be gender neutral. We both should enjoy the space meaning my usual ultra girly aesthetic (like this office I really love) is definitely out. 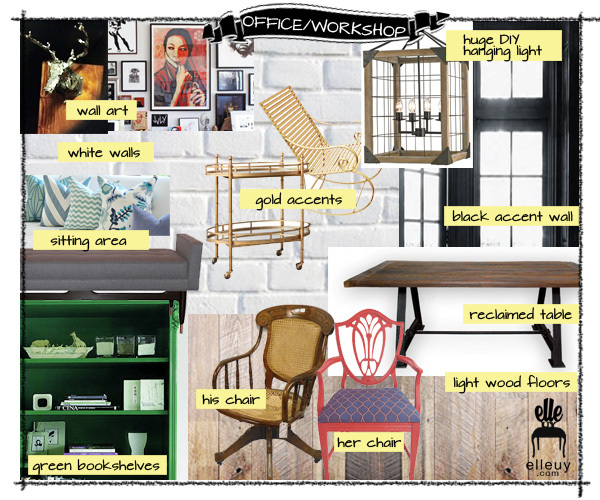 But thank goodness I'm now into woods, metals, blacks, which we will use as the neutrals for the space. The floors will be sanded to have a somewhat rustic look. 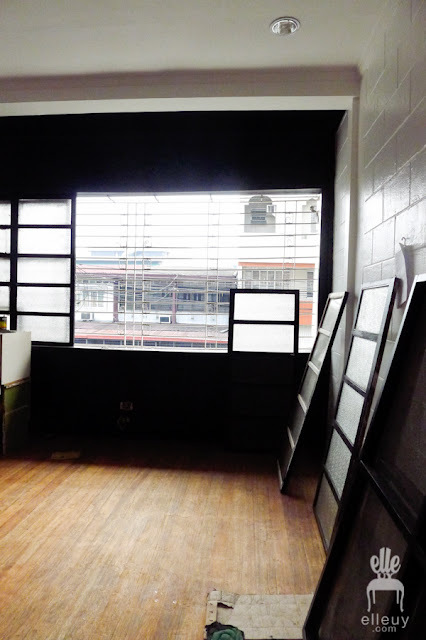 The walls will be painted white, and black for the far wall to modernized the 50's window. Reclaimed wood table will be smacked right in the middle. Accents of gold for a rocker and bar cart. I, of course, can't live without colors, so I'll bring that in through a green bookcase, artworks, throw pillows, and a pink chair. Yey to the pink chair! Told you, you can incorporate pink with a man in the house. The smaller room will be the lounge/bedroom for overnighters. 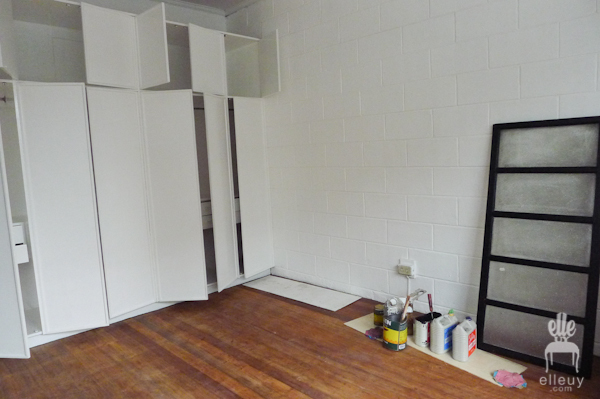 It has some weird big closet layout (the protruding wall on the right) which really closed up the very small space. You can't even fit a double bed in here. We'll be removing the closet and have the floor space needed for a nice size bedroom. I always wanted to try a dark bedroom, so that's what we'll do in here. The walls and ceilings will be a very dark taupe. The coral bed will be the highlight of this room. It would pop against the dark walls. Two different drop light will flank the bed, one is industrial and the other is tiffany to have some his and hers vibe. Most of the furniture we're bringing in are those we already have that we're just refinishing. Even the fabrics we're using for the curtains I already had for some time. 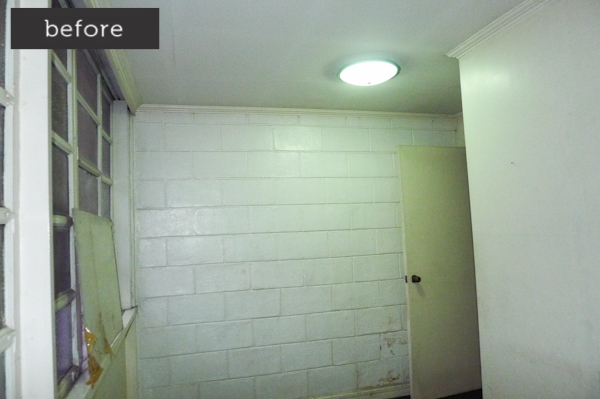 Our goal is to makeover the whole space at minimum cost possible without sacrificing the look we're going for. 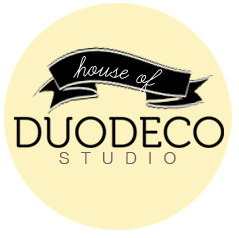 We'll be launching DuoDeco Studio soon! I'm really psyched about this project. Expect a lot of unique furniture and home decor that both guys and gals would love. Some may be really femme (just because I love girly patterns, shapes, and colors) but there's a lot that everyone would appreciate. Our goal, really, is to provide pieces that are beautiful, functional, and won't burn a hole in your pocket. Mixing red and black can become tacky, but when done right, it can be this office.. which is undoubtably fabulous. The key is to mix it with a lot of white or pale gray to balance out all the halloweeny saturated colors. Loving the pattern and all the craziness in this space, it seems like something creative is always cooked up in here.